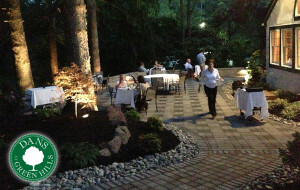 Looking for the perfect location for your wedding reception or rehearsal dinner in the Reading, PA or Berks County area? Look no further than Dans at Green Hills. Dans has been serving the Reading, PA area for over 20 years. We’ve recently relocated from downtown Reading, PA to Green Hills in southern Berks County, less than an hours drive from Philadelphia, PA.
Our new location combines the beauty of rural Pennsylvania with the quaintness of an 1800’s farmhouse. Our Main Dining Room, one of 4 rooms you can reserve for your wedding reception or rehearsal dinner, can host up to 55 people, while our Garden Room and Petite Room can hold up to 30 and 15, respectively. However, the perfect venue for a summer wedding reception or rehearsal dinner would be our brand new patio, built in 2013, that can accommodate up to 60 people. Most of all, Dans is known for our French influenced cuisine that is unmatched in all of Berks County. Dans has won numerous Best of Berks awards and is one of the few restaurants in Berks County that regularly hosts guests that travel from as far as Philadelphia and Allentown. Menus can be customized to suit your needs and offers vegetarian and gluten-free options. To book your rehearsal dinner or wedding reception in the Reading, PA or Berks County area, call us at 610.777.9611 today!